Do not miss, if you’re stopping by the Landes, from 1st of april until 21st of june, there is the “Printemps des Landes”, a big seasonal event, with no less than 1200 dates scheduled, all over the Landes! Enjoy for instance a surf initiation at 19€ in every surf school of the Landes! More informations here! From 12th to 20st August: Lacanau Pro, THE surf contest of Lacanau! May 1st at 9:00 am: participating in the Bike Rally – 12.5 km cycling or rollerblading and 5 kms walk with meals included. Departure from the Bugade room in Carcans. April the 15th and 16th, here is the food and handcraft fair, to tickle your taste buds! - Treasure hunt to be made in family: ” On Robin’s tracks “. A playful moment to discover the city, the Tourist Center delivers free notebook of strolls. - Do not miss the stroll with a fisherman or an oyster farmer to live on the inside their life. 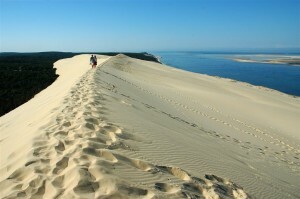 - Pyla Dune : down from the highest dune of Europe, you will be entitled to an unforgettable panorama on the Bay of Arcachon, the forest from the Landes, the ocean and in clear weather, Pyrenees. Must do : settle down in the Co(o)rniche Restaurant to savor a glass in front of an awasome view on the Arguin bench ! - Birds Island : from Arcachon or Cap Ferret, embark to visit the mythical island of Pascal Obispo’s song. Solid and proud, huts built on stits wait for you there. May the 21st: L’Arcachonnaise, THE lady trail, for every ladies! From july the 25th to august the 3rd, do not miss the musical event of Arcachon, Arcachon en Scène! 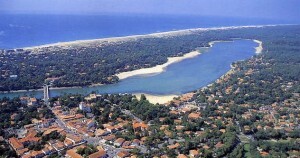 May the 8th, the “foulée des Baïnes”, an epic 20 km race from le Cap Ferret to le grand Crohot beach, open to everybody. From july 7th to 14th, the “Cap Ferret Musique Festival”, with its open air concerts of classic music! From august the 4th to the 6th, the “fêtes de la Presqu’île”, to celebrate the oyster along the bassin d’Arcachon, at Claouey. From august the 13th to 15th, the famous “Fête de la Mer”, at Canon. The 19th and 20th of august, the lighthouse’s evening, a magical moment! - Do not miss the St Jean fountain quack. From july 14th to 16th, Music O Teich, an open air festival with musics, concerts and handcraft shops! From june the 23rd to 25th, Country ô Lake, at la Magdeleine Lake, for country lovers, to feel like in a western movie! From august 10th to 13th, Gujan en Fête, with open air parties, bandas and fireworks! August the 27th, a trail race “pilat-gujan”, open to everyone, on a nice forests to beaches track! Talmont-sur-Gironde, the peninsula where it well makes get lost itself even if you will not arrive there because the tour need to be done walking. Discover the forest of the Curve, its cycle track travels all the forest on about twenty kilometers between Palmyre and Ronce-les-Bains and numerous walks for small and big sportsmen is marked out leaving a big freedom. The citadels of Blaye and Bourg, historical heritage linking in Camp In Van by road of the Corniche Fleurie to discover its habitats. The “Route des Châteaux”, from Macau to St Vivien de Médoc will let you discover some of the most beautiful chateaux in the Bordeaux wine region. Brouage, a small fortified village with a rich history offers wonderful monuments. Mornac sur Seudre, this former fishing and trading port is ranked one of the “Plus Beaux Villages de France”. - The good tips : Treat yourself to an ice cream at Lopez in Royan ! 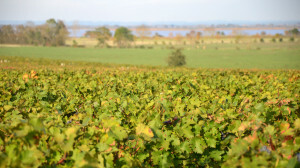 Between Médoc, Saint-Emilion, Fronsac, Pessac-Léognan, Entre-deux-Mers, Côtes de Blaye-Bourg, Saint-Emilion, Pomerol, Côtes de Castillon … The vineyards to explore is big. Many chateaux are waiting for tastings and heritage discovery. - The good tips : in Saint Emilion, there is the vineyard but don’t forget the monolithic church. - Anglet, do not miss the “Chambre d’Amour” beach and take a sit to enjoy wonderful cocktails at the bar tapas Kostaldea, you do not forget the view! - Natural sites for a relaxing and unforgettable walks in the “Réserve Naturelle de l’Etang Noir” in Seignosse, the Natural Reserve of the “Marais d’Orx” or the “Courant d’Huchet”. - Les Landes, from ocean to land, many villages: Peyrehorade, Hastingues, Sorde l’Abbaye, Montfort en Chalosse, Saint-Sever, Tarnos, Seignosse, Dax, Vieux Boucau, Préchacq les Bains in … .. charming, relaxing and comforting, full of history and activities. From august 24th to 27th, the Newave festival, a pop-up lifeplace, all about the surfing lifestyle! - At the “Hotel du Palais”, in the heart of Biarritz, do not deprive yourself of a drink at the piano bar, you will not forget the view but remember to avoid shorts and flip flops! After discovering the “Rocher de la Vierge” (Rock of the Virgin) of course! 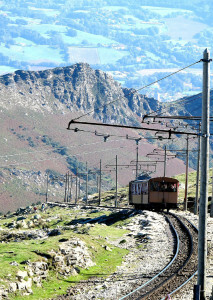 - Embark on the little train of Rhune, this authentic collector cogwheel train dating from 1924, at 905 meters, you will discover the legendary summit of the Basque Country, which dominates the horizon, the French and Spanish coasts and the Pyrenees as well. - In Hendaye, treat yourself to a boat trip to Hondarribia, the old walled city is based on a promontory overlooking the estuary, facing France. Traditional fishing port, its beach on the estuary is very popular. Do not forget to go up to Mount Jaizkibel to have a stunning view on the “Golfe de Gascogne”! - Each village in the Basque Country has its own “Pelote Basque” playground . Do not miss a game! 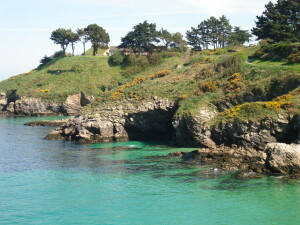 - Get away on the “La Corniche Basque” road, on the shores of the Atlantic Ocean and admire the views. - Abbadie’s Castle-observatory, is an enchanting place, perched on the steep cliffs of Hendaye, built between 1864 and 1879. Itxassou, famous for its black cherry, bordering the waters of the Nive. His seventeenth century church is worth seeing with its galleries on three floors and carved wood. Cambo-les-Bains and its spa Art Deco style including Villa Arnaga and its French gardens are a masterpiece. Every year in October, chocolate and Basque cake are celebrated. Espelette, famous for its red peppers, on every houses appears white facades decorated with red peppers garlands at the end of the summer. Souraïde, small pastoral village at the bottom of Mount Baïgurra, Louhossoa. - In the Basque country, pamper yourself! Between Hydrotherapy, spa or thalassotherapy, to each his desire! - Good tips: In the heart of Old Bayonne, treat yourself to a gelato at Lucile and Thierry’s! “Gelati Shop” manufactures ice cream whom even children recognize “the true strawberry” with which it is manufactured. Enjoy your holidays offering yourself original activities. Meet the passionate Britanny people who desires to share with you their world. Storytelling walk in the “Monts d’Arrée”, discover the bigouden coast, the Broceliande magic with Lady Nora or the “longe-côte”, pick your favourite moment. - The good tip : the “blockhaus” of “la pointe du Grouin”, home to a threatened species of bat. Brittany has great heritage and rich history: castles, fortified towns, churches, museums, cities of art and history, megaliths alignments … so many sites to explore alone or with a guide. English daydream or French elegance, maze of greenery or unusual floral park, you will find in Brittany Parks and gardens in which is good to walk around through the seasons, with family or friends. Impressionism, surrealism, contemporary art … In Brittany you will enjoy exhibition spaces and art museums to visit without moderation! Bring your family to meet many animals in various zoos and aquariums in Brittany. To the extent traditional and innovative skills of Britains today, please visit the many industrial and scientific places that are open to you. From august the 4th to 13th, the so famous “Festival Interceltique de Lorient”! From december the 6th to the 10th, the “Transmusicales” of Rennes, the key event for the new musics! The apps you will need in your pocket ! 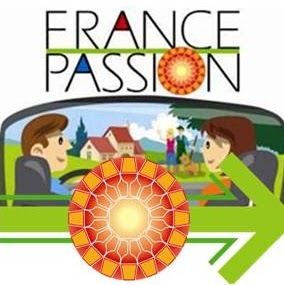 France Passion, welcoming Camp in Van at 1 800 winemakers, artisans and farmers in France … Your most beautiful stages in Camp In Van! First exchanges really appreciated by our travelers in 2014! With Park4night find and share the places you liked to relax, spend the night, have a picnic or clear your head. Campe Dans Mon Jardin offers to campers a friendly form of camping, in addition to wild camping or accommodation in professional structures. 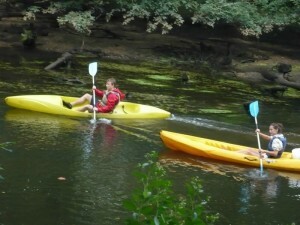 The aim of the service is to link the garden owners with campers in finding accommodation.